Engaging, well made and impressively acted, this is essentially a coming of age chick flick with a slightly rougher edge than usual. Based on the novel by Sue Monk Kidd, The Secret Life of Bees is set in 1960s South Carolina and stars Dakota Fanning as 14-year-old Lily Owens, who goes on the run with her maid, Rosaleen (Jennifer Hudson) after the latest violent outburst from her father (Paul Bettany). Crippled with guilt over having accidentally killed her mother as a child, Lily is seeking the truth about her family's past, armed only with a box of scraps from her mother's life. Lily's search leads her to the Black Madonna honey farm, run by sweet-natured August Boatwright (Queen Latifah) and her two sisters, feisty June (Alicia Keys) and sensitive, child-like May (Sophie Okonedo). When August agrees to let Lily stay, she begins to feel at home for the first time in her life, learning the tricks of the honey trade and developing a crush on fellow honey worker, Zach (Tristan Wilds). 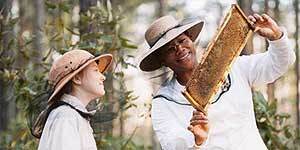 The cast list tells you pretty much everything you need to know about The Secret Life of Bees: Latifah is as likeable as always and Fanning is excellent as Lily, but the standout is Alicia Keys, whose performance here makes you wish she'd make more movies. Similarly, Jennifer Hudson is terrific, if slightly under-used as Rosaleen, while Paul Bettany nails yet another accent as Lily's father and his haunted eyes generate unexpected sympathy for a character that is essentially the villain of the piece. Writer-director Gina Prince-Bythewood evokes a strong sense of period and place, aided by a superb soundtrack and sumptuous photography throughout. Also, the obligatory scenes of racism are well-handled and genuinely shocking in places. The only real problem with the film is that the big tear-jerking moment comes too quickly and doesn't quite ring true. The Secret Life of Bees is an engaging, well made drama, enlivened by strong performances and a script that just about keeps the sentimentality in check.